It’s important to understand what the GOP is trying to do. Every time some upstanding leftist brings up single-payer health care, the punditocracy dismisses them as deluded fantasists without any understanding of the realities of government or markets. But House Republicans are apparently going to vote tomorrow on an Obamacare replacement framework that accepts the entire logic of single-payer. It just does it in the dumbest way imaginable. Let’s understand what House Republicans are trying to do. The American Health Care Act is described as a repeal to Obamacare. But the party’s constituents and even the president of the United States don’t favor such a move, or at least don’t want to deal with the consequences of denying someone coverage because of a pre-existing condition. Yet this is precisely what the House Freedom Caucus demands, based on their belief that “Obamacare regulations” (like insurance companies having to accept sick people) are raising prices. So an amendment negotiated between the Freedom Caucus and a moderate Republican backbencher from New Jersey named Tom McArthur gives states the ability to obtain waivers to several Obamacare requirements, including the “essential benefits” package that defines acceptable insurance, and the “community rating” provision that forces insurers to charge the same rate for all applicants, except for a narrow band based on age and whether or not the patient smokes. This effectively repeals the pre-existing condition exclusion, because in the states that receive the waiver, they can charge an unlimited amount to the sick, pricing them out of the market. States could only get the waiver if they showed that their new plan would either “reduce average premiums, increase enrollment, stabilize the market, stabilize premiums for individuals with pre-existing conditions or increase the choice of health plans,” according to Politifact. But there’s enough wiggle room in there (after all, if you purge the sick from the health-insurance rolls, average premiums would indeed probably go down) that a state government friendly to the cause of dismantling Obamacare would surely grant the waiver. Moderate Republicans grew nervous at the idea that health care would only be affordable for the healthy and not the sick. McArthur claimed, in a press release, that no state could get a waiver unless it figured out how to handle those with pre-existing conditions, like by creating a high-risk pool. These are prohibitively expensive and have failed almost wherever they’ve been tried. McArthur also said that only those with a lapse in coverage can be charged more based on health status, but this creates an incentive for health-insurance companies to jack up prices for everyone, to weed out the poor, who correlate with those who require more health care. The point is, the moderates needed more assurances. 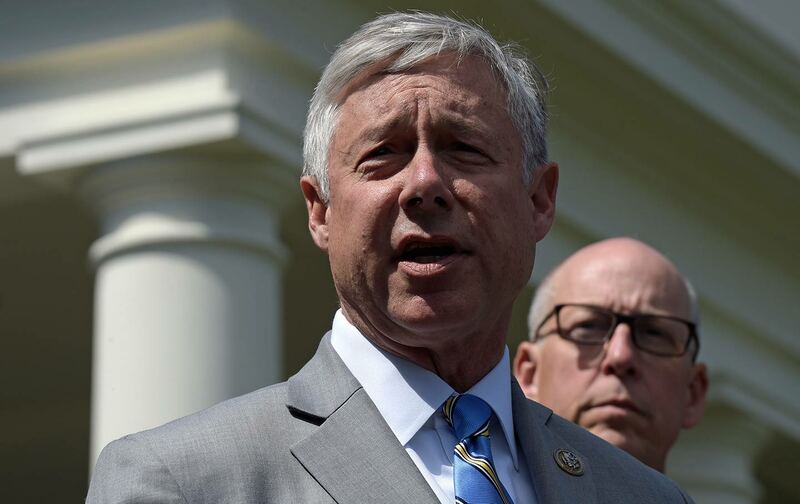 So Representative Fred Upton engineered another amendment to alleviate the consequences of the previous amendment. Upton’s provision would use $8 billion in public funds over five years to compensate people with pre-existing conditions who face higher health-insurance prices (possibly through a privately issued high-risk pool, possibly through just subsidizing those who experience cost increases; it’s a bit unclear at this point). After going over this with President Trump, Upton, and Representative Billy Long reversed their position and agreed to support the bill. The vote is likely to be tomorrow. This is so convoluted it’s going to be hard to work through. And the money involved, a mere $1.6 billion a year, is really pathetic and nearly 90 percent less of what experts say would be necessary to properly fund such a mechanism. But let’s break down what Republicans are doing. By allowing health-insurance companies to discriminate based on a pre-existing condition, the GOP would break the market for this subset of people. And then they would use government funds to fix this market failure. But they would funnel it directly to health-insurance companies, rather than eliminating the middleman. This is single-payer for dummies. In a single-payer system, the government picks up the health-care costs for the population, paid for through progressive taxation. The market power of having one insurance payer can work to lower overall health care costs, making the system sustainable. In Trumpcare’s single-payer for dummies, the fragmented private-insurance middleman remains intact. But taxpayer dollars still pick up the health-care costs for those who cannot afford it. Instead of acquiring market power, they just give those taxpayer dollars to the private middlemen, which tells the private middlemen they can charge whatever they want and always get paid. After all, if the paltry $8 billion doesn’t work to prevent massively increased costs for those with pre-existing conditions, the public will cry out for more protection. And since Obamacare created an expectation that the sick would be protected in America, that would lead to more taxpayer dollars put to this use, leading to higher prices, and more money, and so on, in a death spiral. That’s why it’s single-payer for dummies: It has all of the logic of the government stepping in to make sure everyone has health-care coverage, with none of the efficiencies that should create. Keep in mind that all of this is being done to allow House Republicans to get something, anything, that they can call “‘Obamacare repeal” out of their chamber, regardless of whether the Senate will pass it. (Ron Howard voice: they won’t.) It’s a purely political maneuver. But they’re replacing a twisted Rube Goldberg formation with an even more twisted, even more Rube Goldberg formation that uses public money to plug self-created holes. You’re essentially telling insurers to discriminate and then paying them off for the discrimination. And if you’re using public funds to subsidize insurance and ensure affordability, the next logical step is to have the government pay all health-care costs up to a certain level. Of course, these are Republicans we’re talking about, so at the same time that they’re subsidizing private coverage, they’re dismantling Medicaid, the government-run system for the poor, cutting it by $800 billion. This will only pull more people into this pre-existing-condition coverage gap nightmare, which the American Health Care Act handles by shoveling more money to insurance companies as a bandage. House Republicans are so desperate to repeal Obamacare, then, that they’re introducing the stupidest possible version of government-run health insurance. It’s a taxpayer handout to for-profit insurance companies, rather than a centralization of the market in not-for-profit hands, to better negotiate with providers. Republicans can’t bring themselves to admit that the government is the only entity able to ensure quality, affordable health coverage for everyone. But anyone who reads their legislation can see that truth.